Everybody knows that when a television show jumps the shark and is no longer good, the producers will introduce a new character – say, a cute wise-cracking little kid – or a new plot device to help boost ratings. That’s what happened to Diff’rent Strokes. When Danny Cooksey was introduced as the little boy named “Sam”, the show was doomed. But, he lasted two years on that dumb program and gave it new life allowing Todd Bridges and Dana Plato to buy more drugs. Danny didn’t do much after that but he went on to co-star in Terminator 2 as John Connor’s juvenile delinquent buddy. 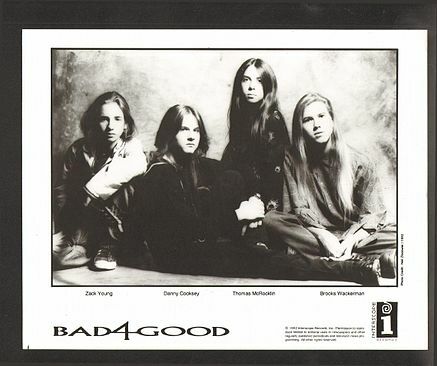 However, in 1992 a strange thing happened: Cooksey suddenly emerged on the metal scene, appearing as lead singer for the all boy heavy metal band “Bad 4 Good”. Hahaha… allowed Dana Plato and Todd Bridges to buy more drugs. i never liked the Sam character. Not nearly as entertaining as Cousin Oliver on The Brady Bunch.